You won’t get any better recommendation for a joint like this than you’ll get from bluesman and humorist, the inimitable C.W. Stoneking, who found the place by accident on one of his trans-American odysseys between here and there. It’s the sort of place most outsiders with a taste for southern cookin’ would speak of rather reverently as “that shack in the middle of nowhere with great ribs.” The allure of its obscurity is enticing. But wait til you try the food. 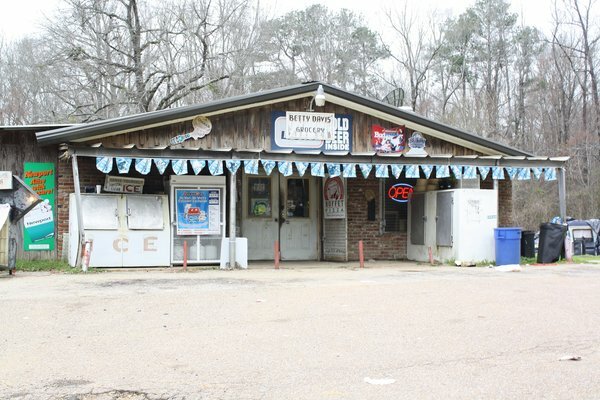 This small, family-run grocery with no seating has smoked meats worth raving about, though it is probably still one of the best-kept secrets in the South. The name itself, which supposedly is the Mom’s name of the Mom and Pop proprietors, is a draw-card in and of itself. When and if you go on the quest to find this joint, don’t believe what your GPS says. It’ll be direct you to get on Old Oxford Road off of 7 *NORTH OF* the 310 junction. Ignore that and get on Old Oxford Road where it joins 7 *BELOW* 310. Because if you do that, my friends, it’s the very first property you come across. When you get there, the grocery is mostly that in name only. The majority of its customers stop by for a beer or three, and some fine pulled pork sandwiches. No need to worry about parking either, as there’s room for about a dozen cars, and there’d be even more if the rusted-out car cemetery out back was cleared. There’s a table inside, but it looks like it’s set up for a private late-night poker game or the family’s on-site meals and meetings. In other words, it doesn’t look like it’s there for you, which of course only adds to the charm. Even though there are no signs indicating that they have hot food, and the lunch meats behind the deli counter look like they didn’t see much action since Bonnie and Clyde ate here, when you ask the nice gentleman behind the counter if he has any BBQ, you quickly discover he does indeed. Ribs and pulled pork. Get one of each. 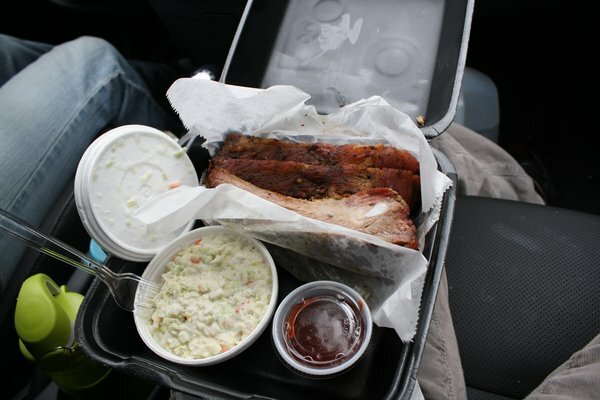 The ribs are a pork rack with a container of sauce on the side. The sauce is closer to sweet and sour sauce in taste and consistency, but the ribs are to die for. And they don’t fight too hard to get off the bone either. The pulled pork is the happiest experience the place has to offer. Tasty and ample for most appetites, it is more than lavishly punctuated by the coleslaw, which is as creamy and fresh as it is homemade. The biggest draw for all the romantics out there is the fact it’s in the middle of nowhere. The problem with being in the middle of nowhere is you don’t get too many customers, which means the folks that run it are always friendly and ready for conversation.